Je Tsongkhapa, the founder of Gaden Monastery, was born in 1357 A.D. in Tsongkha region of Amdo, eastern Tibet. He received his novice vows at the age of seven from Chöjé Dhondub Rinchen (b. 1309), who had taken him under his spiritual care soon after his birth, and was given the name ‘Lobsang Dragpa’ (kind heart, fame). From him he also had received his earliest introduction into Buddhist lineages and their philosophical and spiritual legacy. At 16, under his spiritual mentor’s advice and support he set out for central Tibet to study Buddhism in depth. Based on his mentor’s guidance, he sought out masters who were both lineage holders and the leading experts and exponents in their field of Buddhist scholarship and practices. Chennga Rinpoche of Drigung; Lama Jamrim-pa, the reigning expert on Maitreya treatises at Nyethang Devachen; the Sakya master Jetsun Sonam Gyalstan, and Redawa Shönu Lodoe at Sakya, the forerunner and leading protagonist of Buddhist logic in Tibet; Khenchen Rinchen Namgyal, successor to the formidable Buton Rinchendrub at Žhalu, are just some of these legacy holders from all schools of Buddhism in Tibet, under whom the young aspirant studied and trained. With unwavering diligence and exemplary guru devotion to each and every of his tutors and preceptors, sitting for public debate examinations at any of the six monastic seats of learning in central Tibet upon thorough mastery of his most recent domain of study, while continuing to study a new field after each such public examination: By the age of twenty five his name as an expert in all realms of Buddhist sutra and tantra began to permeate the length and breadth of Tibet. It was around this time in Monkhar Tashi Dong that, following a winter evening fireside chat, the conversation among his circle of close disciples came to how the Kazhipa (an expert on Buddhist system of logic, Prajnaparamita and Madhyamika philosophy and Vinaya or Abhidharma) Sherab Senge had once delivered a public lecture, on the extempore, on eleven treatises. The young savant was devoutly asked, perhaps unwittingly, whether he could deliver a similar teaching. Tsongkhapa replied, a bit reluctantly, that he might be able to do so were he to make the effort. “By all means, please try”, they urged him. 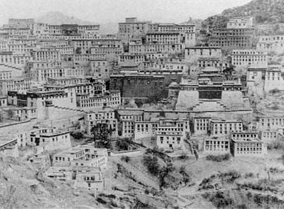 In response, after letting listeners arrive from central and other regions of Tibet, he delivered a public teaching attended by thousands: From dawn to dusk, through fifteen sessions each day, for the next three months, without referring to any source, he expounded on seventeen major treatises. Je Tsongkhapa founded Gaden Monastery, as Buddha Shakyamuñi had prophesied, in 1409 A.D., so that his disciples could gather, live and study near him at one place. They came to be called Gaden-pas—’those of Gaden Monastery’. In time this evolved into Geden-pas—’the virtuous ones; and then into Gelug-pas—’holders of the virtuous tradition’. After a seamless life of study, practice, propagation and rejuvenation of Buddhist studies and practice and values, and of almost universal renown in Tibet, Mongolia and China, Je Tsongkhapa passed away at the age of sixty on the 25th, of the 10th of Tibetan month. Some time earlier, he had entrusted the future of his legacy to Gyaltsab Je (b. 1364), one of his foremost disciples. So began the line of Gaden Tripas—Successors to Je Tsongkhapa’s Golden Throne at Gaden Monastery. The line continues to this day. Je Tsongkhapa founded Gaden Monastery, as Buddha Shakyamuñi had prophesied, in 1409 A.D. Through the rigors of academic instruction, it gradually expanded into two distinct monastic seats or colleges—Gaden Shartse and Gaden Jangtse. Each of these monastic seats, for administrative efficiency, has autonomous Khangtsäns (houses). Palden Dokhang Khangtsän, one of the eleven administrative houses within Gaden Shartse monastic seat at Gaden Monastery, grew out of a close fraternity of disciples under the master Chöjé Lodoe Chokyong, a close contemporary of Je Tsongkhapa—and his 5th Successor. Over time, Dokhang Khangtsän sometimes came to be referred to as the ‘right hand’ of Gaden Shartse monastery, on account of its sustained contribution over many centuries towards the preservation of Shartse’s traditions and monastic discipline. Among other members at Gaden Shartse, from Dokhang Khangtsän, is Tri Jhangchub Chöphel (b. 1756), the 69th Successor; Tri Tsultrim Palden (b. 1839), the 85th Successor, and Tri Lungrig Namgyal (b. 1927), the 101st Successor to the Throne of Je Tsongkhapa..
After the Tibetan Diaspora of 1959, over the years, through intense dedication and private initiative, surviving monks and spiritual masters from Tibet slowly reestablished many monasteries in different Tibetan enclaves in south India. Gaden Shartse monastery, complete with its eleven administrative houses, was reestablished in this manner through the hard work and dedication of its surviving members from Tibet with continuous support from its wellwishers, patrons and masters, especially Kyabje Trijhang Rinpoche (b. 1900), the reincarnation of the 69th and 85th Successors of Je Tsongkhapa and younger tutor to His Holiness the present Dalai Lama. Due to its inability to accept a deeply divisive religious policy being persued with political vigor since 1996 by its supporter, Palden Dokhang Khangtsen finally chose to continue its educational programs as a distinct entity. 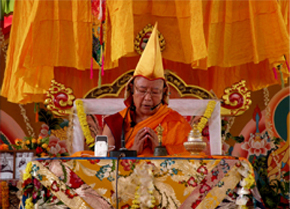 On 23rd, February 2008, much against its separate from Gaden Shartse, it opened a new chapter in its history by becoming, from an administrative house within a monastery to Shar Gaden Monastery (eastern Gaden), a full-fledged Gelug monastic seat. Being a robust administrative house in Gaden Shartse for more than four centuries, Shar Gaden is a new Tibetan monastic seat under its first abbot, the Ven. Geshe Losang Phende, a contemporary disciple of Kyabje Trijang Rinpoche, Kyabje Zong Rinpoche (b. 1906), Kyabje Zemey Rinpoche (b. 1934), Ven. Lati Rinpoche and other eminent Tibetan masters and scholars from Tibet. With over 750 fulltime members including reincarnate masters of historical renown, holders of rare Gelug lineages, meditators and scholars, administrative members and students. Its educational and academic programs in Buddhist sutras and tantras are independent, and on a par with the excellent contemporary programs of other Gelug monastic seats in Tibet and in India. Since 2009, Shar Gaden has opened an Administrative Office, Educational Development Project, the Board of Gelug Examination, a Teachers’ Committee, Library, Computer Department and Shar Gaden Clinic. As other Tibetan monastic seats, the Administrative Office, an elected body under the administrative and spiritual guidance of the abbot, oversees the academic and administrative programs.The Educational Development Project will pursue innovation and determine the course of academic development at the monastic seat. The Board of Gelug Examination will monitor the academic standard of Shar Gaden, and of Serpom Monastic Seat in Bylakuppee, at present. The Library, Computer Department and Clinic are open to all persons regardless of political, religious or ethnic affiliation. From the abbot down, all these bodies are voted into office by the monastic community. All the personnel at the above bodies are volunteers from within the monastery.